If you’ve followed Silke Kitchens since our inception, you know that we are proud of a number of things. We’re proud that we offer some of the highest quality, German style kitchens at very competitive prices; we’re proud of the fact that we work so closely with a number of top-of-the-line companies; one of the things we’re most proud of, however, is the fact that creating and designing your dream kitchen with us is so phenomenally easy. 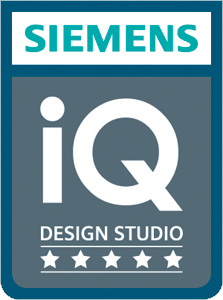 One of the things that makes that process so easy is that we’re registered as a Siemens iQ Design Studio. We’ve touched on our partnership with Siemens before, but as a brief reminder: Siemens are a German company with a finger in almost every kind of manufacturing field you can imagine, from fire safety equipment to medical equipment, although naturally it’s their kitchen appliance division we’re most interested in. Our partnership extends not only to providing a number of their ultra modern kitchen appliances in our kitchen packages, but also by adopting their iQ Design Studio model. So, what exactly IS a Siemens iQ Design Studio, some of you might be asking yourselves? It’s fairly simple, really; a Siemens iQ Design Studio is a kitchen provider marked for it’s excellence by Siemens personally, staffed by design experts with full training in the companies wide range of appliances, and are more then willing to work closely with their clientele during the design brief stage. Many retailers that are assigned iQ Design Studio status also have live cooking appliance demonstrations within their showrooms! In essence, a Siemens iQ Design Studio-certified kitchen company offers it’s customers a personal, easy, but no less professional service that is practically unrivalled in both customer satisfaction, and the quality of the end result. What, exactly, does being a Siemens iQ Design Studio mean for Silke, and by proxy your experience with us? Well, for starters, it allows us unparalleled access to a number of Siemens incredible appliances, and a number of our kitchen packages include Siemens-branded Ovens, Fridges, and Dishwashers to name just a few of. Secondly, as briefly touched upon in the previous paragraph, our designers are fully trained in the operation and installation of the Siemens appliances we offer- and that’s on top of the fact that our designers are experts in the field of kitchen design, too. In addition, our dedication to supplying only the most cutting edge appliances (going hand in hand with our ultramodern design philosophy) puts us in similar standing with Siemens, who themselves offer some of the most cutting edge appliances on the market. You can not only trust that the design experience will be easy, friendly, and readily understandable, but you can also trust that the end result of all the work will be both stylish and functional, no matter the amount of space or budget you’re working with. And finally, one of the features of our design phase is the use of an ultra realistic, top-of-the-line 3D modelling program that ensures the plans we make for your kitchen are as close to the end result as is physically possible. Pairing that with the benefits that come with being a Siemens iQ Design Studio, and it’s a no-brainer as to why so many people choose to work with us over other kitchen providers. As stated in the initial paragraph, we are proud of many things and rightly so, we believe. But perhaps what we’re most proud of above anything else is that with us, the sum of our parts; the design, the range of appliances and worktops, and the services we offer, are not only fantastic on their own, but combine to create something truly phenomenal.